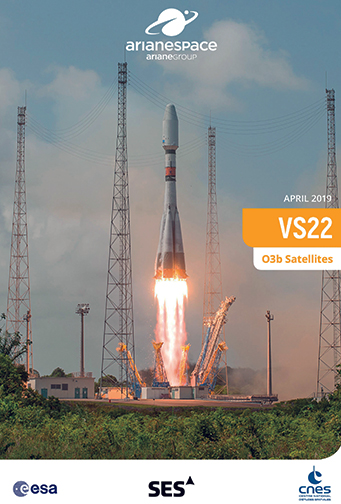 With a successful Soyuz launch that completed the first phase of SES’ O3b constellation, Arianespace today reaffirmed the company's ability to support the growing global market for such on-orbit satellite systems. Lifting off mid-day from the Spaceport in French Guiana, the workhorse launch vehicle delivered the 17th, 18th, 19th and 20th O3b satellites into a circular orbit during a flight lasting 2 hours and 22 minutes until final separation — the total payload lift performance was estimated at 3,198 kg. Lifting off mid-day from the Spaceport in French Guiana, the workhorse Soyuz launch vehicle delivered the 17th, 18th, 19th and 20th O3b satellites into a circular orbit. After an initial powered phase of Soyuz’ three lower stages, the flight — designated VS22 in Arianespace’s numbering system — included three burns of the Fregat upper stage to place its passengers at their targeted deployment point. The O3b fleet of MEO satellite is a proven non-geostationary constellation that provides commercial broadband services today, delivering carrier-grade services. Operating at an altitude of approximately 8,000 km., it serves customers in nearly 50 countries. By increasing the O3b constellation’s size from 16 to 20 satellites, the SES Networks business unit of SES will offer enhanced coverage while providing greater service availability and reliability — responding to increasing demand for bandwidth from governments, as well as the telecom, cloud, maritime and energy markets. The company’s current launcher family—– comprising the heavy-lift Ariane 5, medium-lift Soyuz and lightweight Vega — is perfectly suited to launching innovative space systems. Ariane 6 and Vega C, Europe’s next-generation launch vehicles, also will offer the flexibility needed to meet evolving customer requirements. 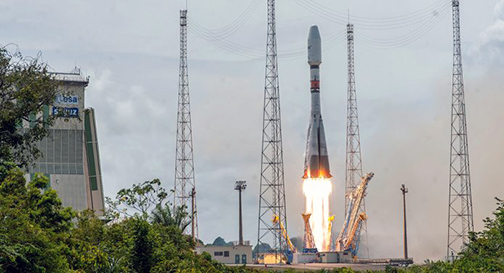 This success is the fourth of Arianespace’s missions targeted for 2019 using its full launcher family, and the second this year with Soyuz. SES Chief Technology Officer Ruy Pinto in his post-launch comments from the Spaceport said the company is grateful to Arianespace for working with the firm throughout all these years and will, hopefully, continue to work with the company with the next generations of launch services that are coming around the corner.id . “Thanks to the entire Arianespace team that helped us throughout the campaign and made this a successful launch. John-Paul Hemingway, CEO of SES Networks, added that this launch marks a very important part in the O3b journey. The company started O3b with this bold vision of changing lives by connecting people and wanted to create a meaningful impact, and such has occurred, addressing underserved communities with high-performance internet. As this launch completes the firm's first-gen O3b system of 20 satellites, it also marks the transition into the company's next-generation MEO system, O3b mPOWER, the only fully-funded NGSO broadband system in development today. When O3b mPOWER launches in 2021, SES will bring massive scale to this proven O3b model — driving digital transformation and cloud adoption virtually everywhere on the planet.